O n the morning of May 26, 1990, Michael Warren was in a car with two of his friends, on his way to a horse race in Miami. He was half-way there when his wife’s son, Joey, called with the news. 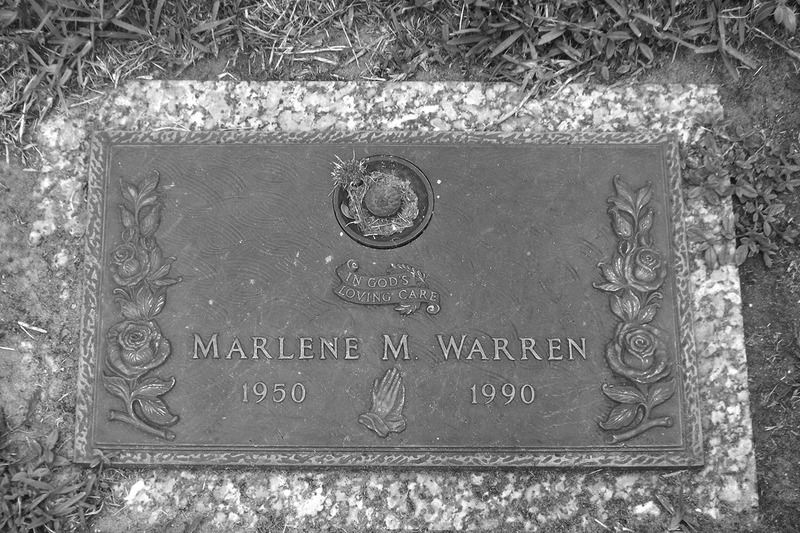 Michael’s wife, Marlene Warren, had been shot. Michael turned around and headed straight for the hospital, where his wife was clinging to life after being shot in the face by a killer dressed as a clown and delivering balloons and flowers. He wasn’t at the hospital for very long before the glare of investigators turned his way. An anonymous call came in to police within two hours of the shooting, telling them to ask Michael Warren a few questions, as well as the young woman he was having an affair with, Sheila Keen. Sheila Keen came from Clewiston in Florida’s heartland region, where she grew up in a close-knit family. Sheila’s dad, Robert, owned a construction company in nearby Indiantown, an agricultural community in the middle of the state. She was a striking brunette who attracted a lot of boys and loved country-music dancing and off-roading through the mud and woods. She dropped out of high school to attend adult education, and she had brushes with the law. In 1984 when Sheila was 21, she was charged with shoplifting $77.60 worth of merchandise in Palm Beach County. A couple of years later, police in Margate, Florida, arrested her on a misdemeanor theft charge. She pleaded guilty and was sentenced to six months of probation. Sheila got pregnant when she was 23 years old. Six months in, she married the baby’s father, Richard Keen, in front of a notary on May 13, 1987. The Keens ran a used car lot and repossessed vehicles. That’s how Sheila met Michael Warren, on the lot of Michael’s Bargain Motors. They began an affair, friends and employees said, and by January 1990, Sheila had split up with Richard. Michael Warren told police he didn’t know anybody who owned a car like the white Chrysler LeBaron convertible that the clown used on the day of the murder. His car lot, Bargain Motors, only dealt in Chevrolets. But Michael’s biggest competitor, nearby Payless Rent A Car, did. And just 12 hours after Marlene was shot, another anonymous tip came into police. The caller said that a white Chrysler LeBaron had been stolen from Payless just two weeks earlier in a case that was linked to Bargain Motors. A couple visiting from out of town had rented a LeBaron from Payless. They called a number they found on an ad in a telephone book to get instructions for how to return the car — but they unknowingly called Bargain Motors, instead. The person who answered the call told the couple to leave the car outside the gate to Payless, with the keys in the sun visor. So they did. Later they had second thoughts about leaving it and returned to Payless — but the LeBaron was gone. Police discovered that Payless had recently sued Bargain Motors over the phone book ad. It was titled PAYLESS and in smaller letters was written “A Bargain Auto Rentals.” The Payless lawsuit said the Bargain Motors ad was deceptive, and Bargain was ordered to pay $35,000. An employee at Bargain told detectives that Michael stole three cars as “payback for the lawsuit.” And the LeBaron was one of them. The employee said he drove Michael and Sheila to Payless and watched Michael get into the LeBaron, take the keys from the sun visor, and drive off. Then, the day before Marlene’s funeral, the stolen LeBaron was found. It was in the parking lot of a Winn Dixie grocery store, where an employee reported it as abandoned. Police traced it to Payless Rent A Car. When police searched the LeBaron, they found curly orange fibers, possibly from a wig, on the front passenger seat, back seat and inside the driver’s door. They also found several strands of long, brown hair. They announced they found the killer clown’s getaway car. Investigators also had leads on the balloons and flowers the killer brought to Marlene’s door, as well as a clown suit. Two employees of a Publix grocery story about a half mile from Sheila Keen’s apartment said a woman purchased a Memorial Day arrangement of flowers — red and white carnations in a white basket. She also bought two foil balloons. It was less than 90 minutes before Marlene’s murder. Then the owner of a costume shop in West Palm Beach told police that a woman came into her store the Thursday before the shooting to purchase a clown suit. She chose the cheapest one in the shop, a candy-pink and yellow suit with an orange wig and red foam nose. She told them a woman would be wearing the costume, and she needed extra white paint, enough to cover an entire face. It cost $36.50 and the woman paid with 20-dollar bills. The employees from Publix and the costume shop all identified Sheila Keen from a photo lineup as the customer who bought the flowers, balloons and clown suit. Hours after the clown’s getaway car was found at the Winn Dixie grocery store, detectives obtained a search warrant for Sheila Keen’s apartment. They collected shoes, t-shirts and jackets as well as a hairbrush, a bathroom trash bag and a full vacuum-cleaner bag. A police report also showed they found synthetic, orange fibers. Sheila refused to cooperate without a lawyer. Michael Warren also had stopped talking to investigators and hired a lawyer. The next day, as Marlene Warren was laid to rest, investigators watched her funeral from a van. One detective conducted video surveillance while an agent from the organized-crime bureau photographed funeral guests with a 35-millimeter camera. While investigating Marlene Warren’s murder, police discovered illegal activity going on at Michael Warren’s car lot. Police learned that Michael had been overcharging customers on insurance. He was also rolling backing mileage on rental cars to cover warranties, and on used cars so he could charge more. On Oct. 25, 1990, an arrest warrant was issued for Michael Warren and two of his employees, 21-year-old twins Ronald and Donald Carter. Investigators raided Bargain Motors that night. They took away filing cabinets filled with business transactions and combed the car lot looking for evidence of stolen vehicles. They arrested Ronald Carter at the lot but his brother wasn’t there. Neither was Michael. But the next day, he turned himself in at the Palm Beach County Sheriff’s office. The state charged him with 66 felonies on counts of racketeering, grand theft, conspiring to commit grand theft, operating a chop shop and dealing in stolen property. It took years for the case against Michael to wind through the court system. Meanwhile, police received reports the he vacationed in the Bahamas with Sheila Keen and that he was possibly scheming about how to disappear. A police arrest photo of Michael Warren. In July 1992 his trial got under way. It took two weeks as prosecutors made the case that Michael was duping customers and insurance companies for financial gain. And Michael’s lawyer argued that discrepancies in mileage on car rental and sales agreements were just the result of sloppy record keeping at Bargain Motors. But the jury convicted Michael on one count of racketeering, 21 counts of odometer fraud, 11 counts of grand theft and 10 counts of petty theft. Michael served out his prison time in South Florida, the majority in a minimum-security work camp in Homestead, south of Miami, where his prison record was spotless. After four years, he was released early for good behavior. On New Year’s Eve, 1997, Michael walked out of prison and into a fresh, new life. A marriage certificate shows that Michael married Sheila Keen, who changed her name to Sheila Warren, in Las Vegas on Aug. 15, 2002, a dozen years after his wife’s murder. On the certificate, the Warrens reported they would be living in eastern Tennessee. There, Sheila was known by the locals as Debbie, and she and Michael spent years running a popular fast-food drive-thru called the Purple Cow. The Warrens were hard workers. For at least a decade and a half, they pulled six-day work weeks to make the burger joint a success. They lived 45 minutes from the Purple Cow over the state line in Abingdon, Virginia. The town is tucked in the Blue Ridge Mountains. It is a quaint community where the oldest building dates back to 1779 and its Main Street is quintessential U.S.A. They lived in a massive, custom-built mansion with a steep, circular driveway, concrete fountain and boat dock out front. It was in the tight-knit Heron Pointe development, a community where neighbors buzz around on golf carts and stop to chat when they see each other. Here, Mike and Debbie were a warm, quick-to-laugh, inseparable couple. They even shared a Facebook page. But nobody knew about their past — that they came from Florida, that Michael had spent time in jail, that his first wife had been murdered, that Debbie’s real name was Sheila. But their past was about to catch up with them. On an early evening in September 2017, Michael and Debbie were driving home to Abingdon after a visit to Debbie’s mother in Vermont. Michael drove their black Cadillac SUV along the winding road. They were less than five minutes from home when a police car pulled them over. A deputy walks to Michael’s driver-side window and tells him he has an arrest warrant for Sheila Keen Warren. “Not yet,” the officer answered. In an interview room at the sheriff’s office, an investigator told Sheila she was being charged with first-degree murder in the killing of Marlene Warren. Sheila replied that she wasn’t going to talk, and put her head down on the table. Police made the announcement at a press conference, declaring that they had caught the killer clown of Wellington. What put Sheila Keen behind bars were hair and blood samples collected decades earlier. In 2013, investigators used a federal grant to form a cold-case task force to solve the murder of Marlene Warren. Earlier DNA tests had been inconclusive, but technology had advanced exponentially in the three decades that followed. New tests produced enough evidence for prosecutors to charge Sheila. She pleaded not guilty and prosecutors announced they would seek the death penalty against her. Michael Warren has not been charged as of early November, 2018. Lead detective Paige McCann said the investigation is not over. “The case is still open and we will work diligently to determine if anyone else was involved,” McCann said after Sheila Keen’s arrest. Michael Warren remained in Abingdon, Virginia, where he lives in the lakefront mansion he once shared with Sheila Keen.